This picture hung unidentified in the museum for some time; thanks to Peter Macdonald, it’s now known to be the wedding of Dr John Macdonald, 5 Crowlista, and his wife Catherine who had Uig and Stornoway connections. See the comments for detail – and many thanks to Peter for clearing up the mystery. I don’t know who is this picture, perhaps Peter’s son Peter Norman knows. This is the wedding photograph of Dr John Macdonald,born 10 Oct,1894,the eldest of a family of 13 born to Norman and Ann Macdonald, 5 Crowlista, Uig, and his wife Catherine. Dr John Macdonald M.D,who served in WW1, qualified at Glasgow University, studied tropical diseases in Nigeria before working as a Medical Practitioner in Dudley near Wolverhampton, England. He retired to Brixham, Devon and subsequently moved to Spain where he died on 20 March, 1964.It is believed that his wife`s parents lived in the Manchester area where it is thought the wedding took place. It is also thought that Catherine`s mother may have been related to Macauleys of Islivig (Murdo Politic ? ) and Valtos area and also to Alastair Macrae at some time an undertaker in Stornoway. John and Catherine had a family of two daughters.The date of the wedding in not known. 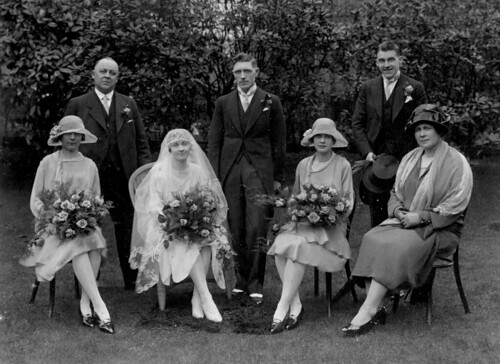 It appears likely that the bride`s mother is seated front right with her husband at rear left. The bride is Catherine Mackay, whose parents were Angus Mackay 31 Valtos, son of Hugh and Ann Macleod (one of the women rioters in Valtos in 1885; see The Crofters’ War) and Christina Macaulay (nighean Dhomhnaill Chaluim Bhàin, Doddle) from Islivig. They lived in the Manchester area. Angus Mackay was a Company Quartermaster Sergeant in the Army Service Corps, DM2/097042, 1039th M.T. Coy and was killed on 7 March 1918 in Egypt. His grave is in Gaza War Cemetery. Angus, had he lived, would have been my great-uncle; his younger brother Kenneth was my grandfather. John and Catherine (or Katherine, as she was registered at birth and at the time of her marriage and her death) married in 1929 (sometime between the end of March and the end of June) in Stockport. I’m sure there would have been a note or report of this in the Stornoway Gazette around the time. Catherine’s/Katherine’s parents, Angus Mackay and Christina Macaulay, married in Chorlton, Lancs, in 1902. Christina Macaulay (b. 15 Oct 1874 in Islivig) died, aged 79, in Stockport in 1954, sometime between the end of June and the end of September. I assume we are cousins but forgive me , who are you? How is it then you knew so much of my uncle and his wedding? John was the oldest of 13 and my father was the youngest so there is much I do or did not know. Peter Norman is my first cousin and in previous posts he did a bit of clarification. Peter, you know my command of Gaelic is poor, do your records show any relation to our families? A good indication of the scope and value of the Comann Eachdraidh, Uig, is the interest stimulated by the publication of an `unknown photograph`. I am sure the bride and groom would have been quite amused. Angus, I accept that you are not related to the Macdonalds of Crowlista, although they had relatives in Bernera. I recall visiting some in Kirkibost in the late 1940`s with my father and bringing a collie pup back to Crowlista. The names Coinneach Ruadh (Macauley ?) a church precentor who had a fishing boat and Domhnall Sgaire come to mind. You will probably be familiar with these names, Angus ! Thank you Teen Anne and Angus for your contributions in respect of Katherine and her family background details. Thank you Norman for setting the ball rolling with the first post on the subject. Congratulations to Uig Historical Society…a well presented site, easy to navigate with interesting articles containing a wealth of history of great value to Uigeachs all over the world. Keep up the good work. Thanks for all your comments; and we’re glad the site is going down so well. We’ve been slow with new material lately but this should pick up soon. Meanwhile, any Uigeachs with interesting stories to tell (for instance about your own family) or questions to ask are very welcome to contribute articles or photographs, either by sending them to me or by requesting your own editing privileges. Your cousins around the world will be delighted. If there’s any topic you would like to see covered, just ask, and we’ll try to find someone who knows something about it. There will shortly be a section of Unidentified Photographs, which I hope will generate more debate! were from Carloway. My mother, Margaret Dornan, was born in Carloway in 1892 but she was raised in Edinburgh. Her mother went home to Lewis to have her first child. They all emigrated to Boston USA in 1910. I’d like to know more about these families. Were they crofters, or fishermen or? My grandmother, Isabella McIver had two brothers that I know of; Norman and John. Ring any bells?